This is a Cuban Corn Stew is called Guiso de Maiz in Spanish. 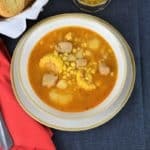 It’s a traditional Cuban soup, and like most Cuban recipes this stew is made from easy to find, affordable ingredients. 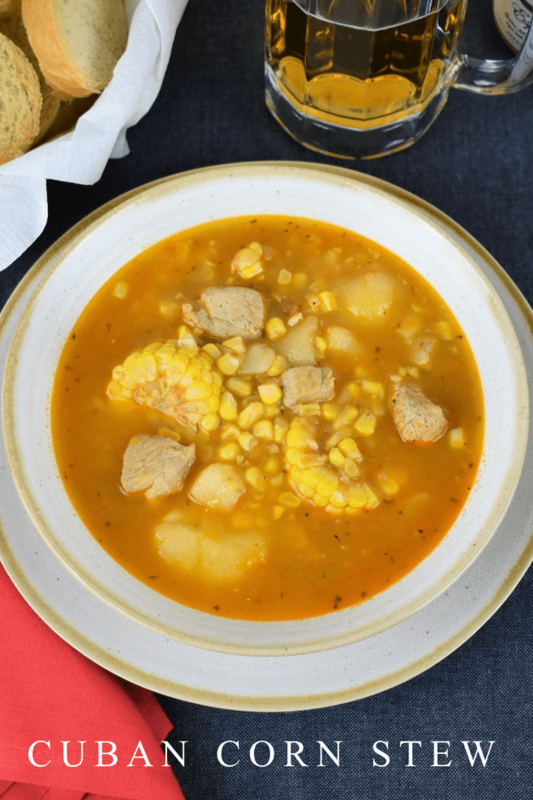 Made with pork stew meat, corn, potatoes and spices, this stew is perfect for tight budgets and hungry appetites. But the real reason to make it, it’s delicious! Season the pork with the salt and pepper. Heat the olive oil in a large pot over medium heat. Fry the pork meat until browned, approximately 5 minutes. Turn the pork occasionally to brown on all sides. When the pork pieces are browned, remove them from the pot onto a plate and keep warm. 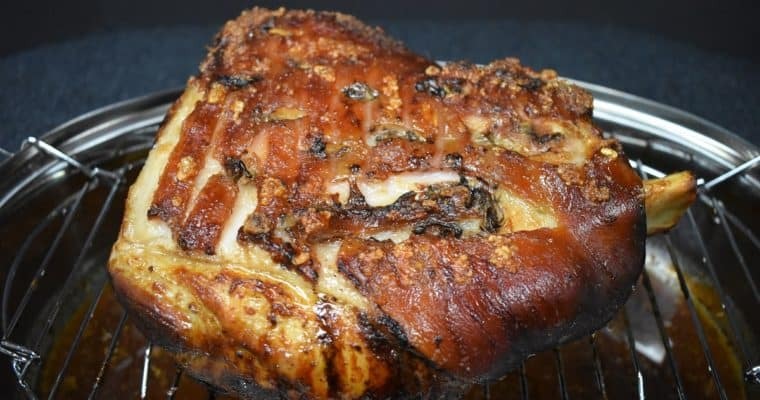 Tent the pork with a piece of aluminum foil or place the plate in the microwave or oven to keep it away from drafts. To the same pot, add the onions and cook for approximately 2 minutes, stirring frequently. Add the garlic, tomato paste, dried oregano and cumin, stir to combine and cook for 1 minute, stirring frequently. Add in the white wine, scraping the bits off the bottom of the pot as you stir. Cook 1-2 minutes, until most of the liquid had evaporated. Add the chicken broth and the reserved pork pieces to the pot. Raise the heat to high, bring the broth to a boil, lower heat to medium, cover and cook 10 minutes, stirring occasionally. Add the potatoes corn kernels and corn cobs to the pot. Give the stew a good stir, cover and cook for 25-30 minutes, stirring only occasionally. Taste the stew and salt and pepper to taste, only if needed. Serve the guiso do maiz with white rice or a side of bread, if desired. Enjoy! 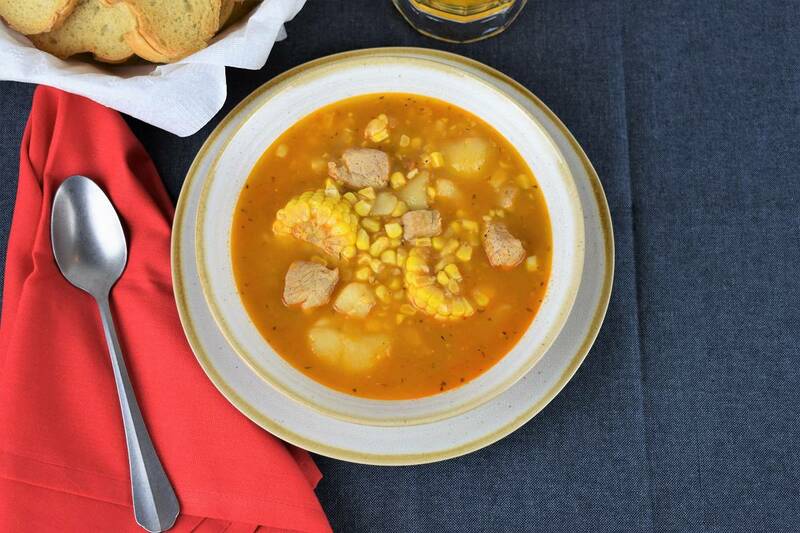 If you can, it’s best to use fresh corn for this stew. But if fresh is not available, frozen corn works well. If you do use frozen corn, cook them just enough to defrost and drain them well before adding to the stew. Don’t add frozen corn to the stew. Follow the package directions to get them going and cut the cooking time so they’re defrosted. This is a Cuban Corn Stew is called Guiso de Maiz in Spanish. 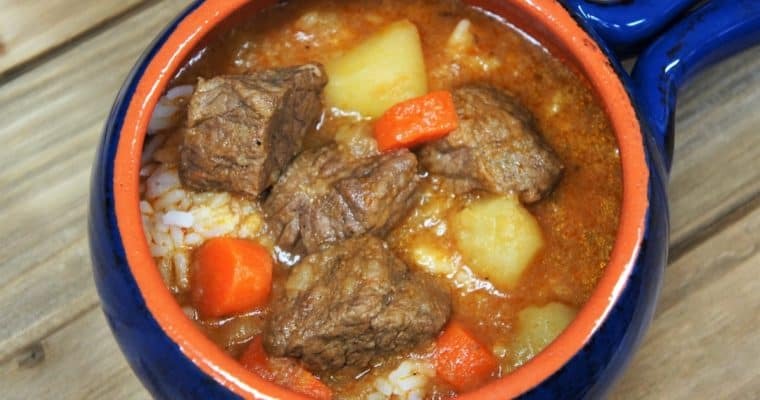 It’s a traditional Cuban dish, and like most Cuban recipes this stew is made from easy to find, affordable ingredients. Season the pork with the salt and pepper. Heat the olive oil in a large pot over medium heat. Fry the pork meat until browned, approximately 5 minutes. Turn the pork occasionally to brown on all sides. When the pork pieces are browned, remove them from the pot onto a plate and keep warm. To the same pot, add the onions and cook for approximately 2 minutes, stirring frequently. Add the garlic, tomato paste, dried oregano and cumin, stir to combine and cook for 1 minute, stirring frequently. Add in the white wine, scraping the bits off the bottom of the pot as you stir. Cook 1-2 minutes, until most of the liquid had evaporated. Add the chicken broth and the reserved pork pieces to the pot. Raise the heat to high, bring the broth to a boil, lower heat to medium, cover and cook 10 minutes, stirring occasionally. Add the potatoes corn kernels and corn cobs to the pot. Give the stew a good stir, cover and cook for 25-30 minutes. Taste the stew and salt and pepper to taste, only if needed. Serve the guiso do maiz with white rice or a side of bread, if desired. 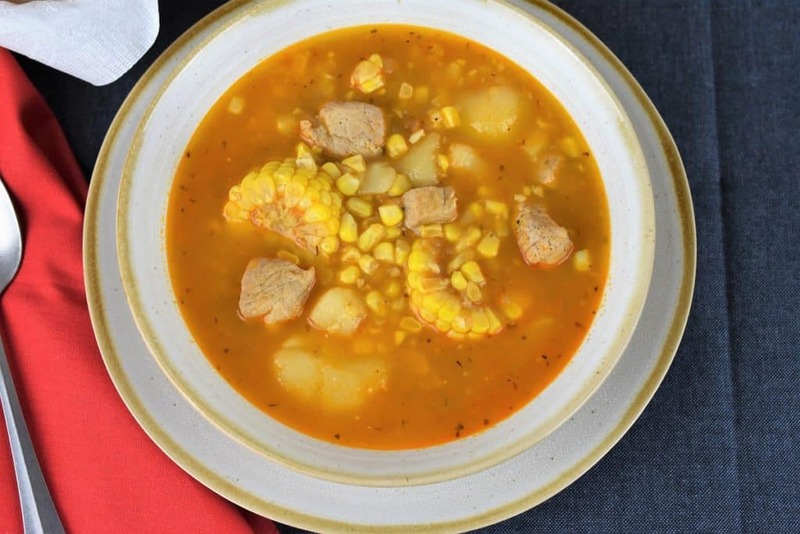 If you can, it's best to use fresh corn for this stew. But if fresh is not available, frozen corn works well. If you do use frozen corn, cook them just enough to defrost and drain them well before adding to the stew. Don't add frozen corn to the stew. Follow the package directions to get them going and cut the cooking time so they're defrosted.